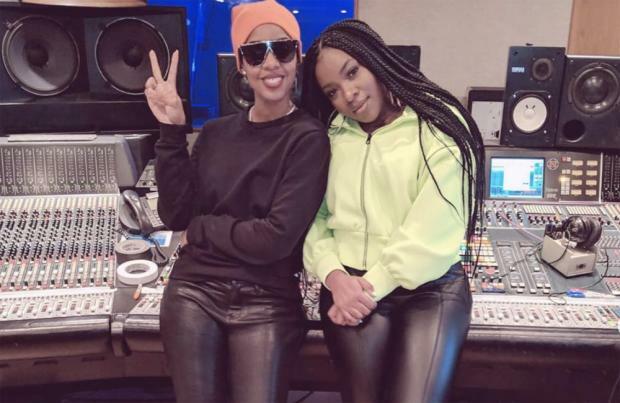 Ray BLK has been in the studio with Kelly Rowland. The 'Empress' singer took to Instagram on Tuesday (26.02.19) to share a series of pictures of her sat next to the mixing desk with the Destiny's Child star and the musicians Black Coffee and Nana Rogues. Haters will say it's photoshop but that's really THE @kellyrowland in the studio wii me leaning on my shoulder fam and THE @realblackcoffee and THE @nanarogues (sic)"
The 35-year-old R&B star is yet to reveal what they were working on and whether the tunes were for her debut record or for the 'Stole' hitmaker. Kelly is currently working on her first studio album since 2013's 'Talk a Good Game' and Ray is set to release her album later this year. The Nigerian-born star no doubt went into fan-girl mode, after she previously admitted she still gets star-struck around her school friend MNEK. Ray attended secondary school with the acclaimed songwriter – who has penned and produced hits for the likes of Beyonce, Madonna and Kylie Minogue – and has so much respect for him as an artist that she's in awe of the 'Never Forget You' hitmaker every time they see each other. She gushed: "What is funny is I've been friends with MNEK for such a long time and before he was so massive. "But still every time I see him there is something about him. "That is my friend and we will have a normal conversation, but I am still star struck by him. "It's because I respect him so much as an artist and I look up to him so much." Ray – who was crowned the winner of the BBC Sound Of 2017 poll – plans to release her debut album next year, and she has set her sights on winning a Grammy or BRIT award one day. She said: "I can't wait for my debut album to come out next year. I hope one day I will win a Grammy and maybe a BRIT."